Chic and Sandra Tabatha Cicero are Senior Adepts of the Hermetic Order of the Golden Dawn. They were personal friends of Israel Regardie who was involved in the Wang Golden Dawn deck, and according to the Cicero's was unhappy with that deck and so comissioned the Cicero's to create another version. But he died in 1985 after seeing only some preliminary sketches. Sandra Cicero created the original artwork in oil, following the card descriptions given in the writings of the Order of the Golden Dawn and Chic Cicero co-wrote the book accompanying the deck. Each Major Arcana includes a Hebrew letter and an elemental or astrological symbol, the court cards show elemental symbols, the pips show astrological and elemental symbols. 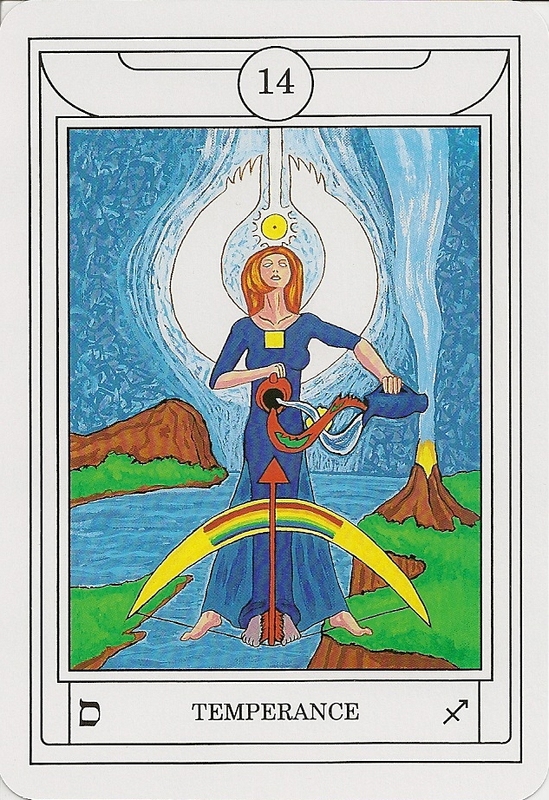 The specific elemental energies are depicted by flashing colours (two complimentary colours, that are on opposite sides of the colour wheel which, when stared at, will swap places with each other in an optical effect).There are two versions of the Temperance card included. 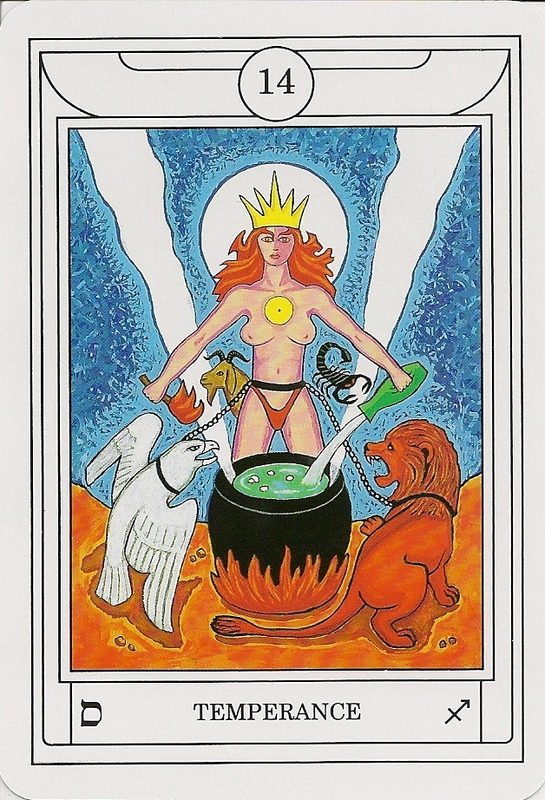 The two Temperance cards are necessary for the Golden Dawn Portal Ritual (Crowley, The Equinox, vol. 1 number 2). The Portal ritual symbolizes the passage from the First to the Second order, the doorway to the "Vault of the Adepts" of the next grade, Adeptus Minor, 5=6. The four grades from Zelator to Philosophus each represent an element, Earth, Air, Water, Fire. The Portal ritual symbolizes the equilibration of all of these, their sublimation into the element of Spirit, hence the alchemical language and Tarot imagery for the Path of Samekh from Yesod to Tiphereth. The Path of Samekh is the direct way, between the Paths of Nun and Ayin, which are Death and the Devil in the Tarot, and are present in the ritual diagram. "Post CXX Annos Patebo" ("After 120 years I will open") was engraved on the tomb of Rosenkreutz which plays a central role in in the Golden Dawn 5=6 grade. The paths of Nun and Ayin total 120 and spell the ancient biblical name ON - Heliopolis the city of the Sun. The letter Samakh spelt in full equals 120 - SMK. 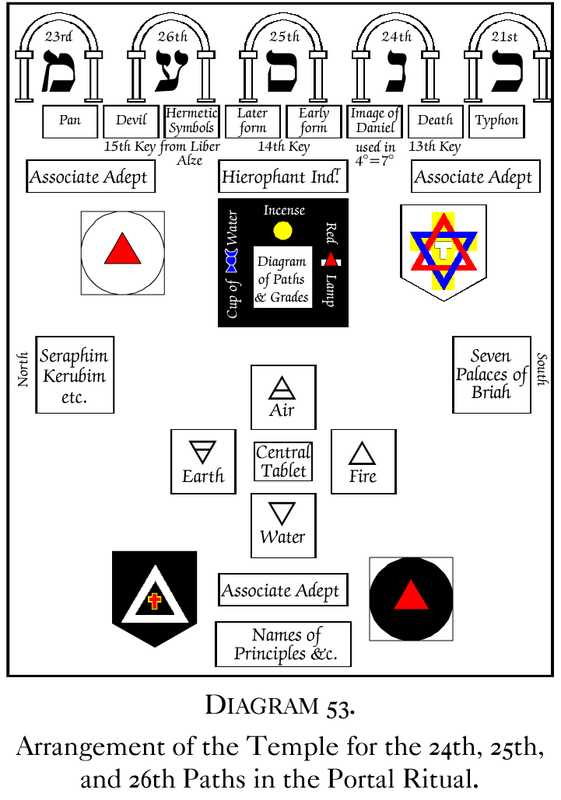 The symbolic age of the adept is 120 (1x2x3x4x5=120) having past through the 5 outer order grades. The deck was first issued in 1991 as the New Golden Dawn Ritual Tarot and reissued in 2000 and 2010 as the Golden Dawn Magical Tarot. The first edition was packaged as cards only in standard cardboard box. Later editions published in 'mini-kit' format, with accompanying small softcover book. There also exists an unauthorized Romanian edition published 1998 by Editura Ananta. This edition substitutes astrological signs for the Hebrew letters on the bottom left corners of the Major Arcana and has a different image for the Hanged Man.